If you don’t want WhatsApp to access your contacts on your iOS or Android phones, you will find the settings on here to do that. Contact list is important for you since it will help you to find people on WhatsApp Messenger. When you disable this feature, names won’t appear on the application and you won’t able to start a new chat. If I Disallow WhatsApp to Access Contacts, Will Blocked Contacts See Me? Swipe down until you find WhatsApp on the list. Check all permission settings for iPhone. That’s all you need to do for iPhone. Let’s see how to do that on Android. Tap on “Settings” on your Android phone or tablet. Choose on “Apps” or “Applications”. Check all permission settings for Android. 1-) You won’t able to start a new chat from your contacts since you won’t able to reach them through WhatsApp. 2-) If someone writes you on WhatsApp, you will only see his/her phone number. You won’t able to see his/her name. That can be annoying. If I block WhatsApp to access my contacts, will people on my contact list see me on their WhatsApp contacts? Thanks for any answers. Thanks for the nice question and the answer of your question is yes. Actually blocking contacts doesn’t make any sense. They will still able to see your WhatsApp account if you stop access to contacts. The thing you should do is blocking each contacts that you don’t want to talk and blocking all contacts will take your time. I use iPhone and iOS 11. I wanted to share only a few contacts with WhatsApp. First I used the A2Z app and deleted all contacts accept some few. After that I shared my contacts with WhatsApp. Then I unshared contacts with WhatsApp again. Restored contacts. When using WhatsApp it worked as anticipated when not sharing contacts. But if you start a group chat and after that enter the group chat configuration. You can add contacts to group chat. Suddenly all my contacts that uses WhatsApp is showing up in a list with the same names as I have named them in my contact list. How can WhatsApp get access to my contacts will I block access to it? Is this a security bug in iOS 11? Can anyone share some insight into this? 1-) You installed A2Z app. 2-) You deleted some contacts with A2Z app. 3-) You shared your contacts with WhatsApp. 4-) You unshared your contacts with WhatsApp. 5-) Restored contacts with A2Z app? Restored contacts on WhatsApp? Have you uninstalled A2Z app? Is it still on your phone? 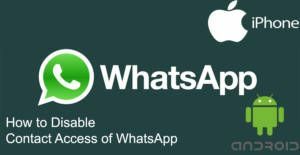 However AFAIK it is not possible to disallow WhatsApp to access for some contacts at the moment. Your all contact list will be affected with the changes you made and A2Z app won’t help you about that. Other people will still able to see your WhatsApp account if you even block WhatsApp access to whole your contacts.